Why We Use Raleigh, N.C. If you were to observe those of us in the Bureau’s Marketing and Communications Department at work, you might notice that the decisions we make as we promote the area to visitors are not necessarily arbitrary ones. That is, they’re not based on our own sensibilities or “hunches,” but on data, marketing research, industry trends and developments, communication theory and a few key, guiding principles. One of the most important of those principles is why we use the term (and consistent styling of) “Raleigh, N.C.” as our destination (product) name. Resulting from DCI’s research was a recommendation that we focus brand communications on “Raleigh, N.C.,” as the area’s key identifier. Here’s an abbreviated version of what DCI said (in the Brand Strategy Manual on p. 11). A Focus on Raleigh, N.C. The usage of “Raleigh, N.C.,” as a destination brand name and identifier allows the GRCVB to concentrate and focus destination awareness, leveraging Raleigh’s status as the largest city in Wake County, as North Carolina’s capital city and seat of state government. Providing a strong anchor and harnessing the energy of the entire area will strengthen awareness, drive interest, convert visitation and grow Greater Raleigh’s tourism sector. Attracting visitors outside of the drive markets is important because it often translates to longer stays that result in greater economic impact. In the two-and-a-half years since, we have consistently used "Raleigh, N.C." at the forefront (but only at the forefront, specifying other place names in more detailed copy) of all marketing communications—in the Official Visitors Guide, on the official tourism website, in email marketing and on visitRaleigh-brand social media accounts. 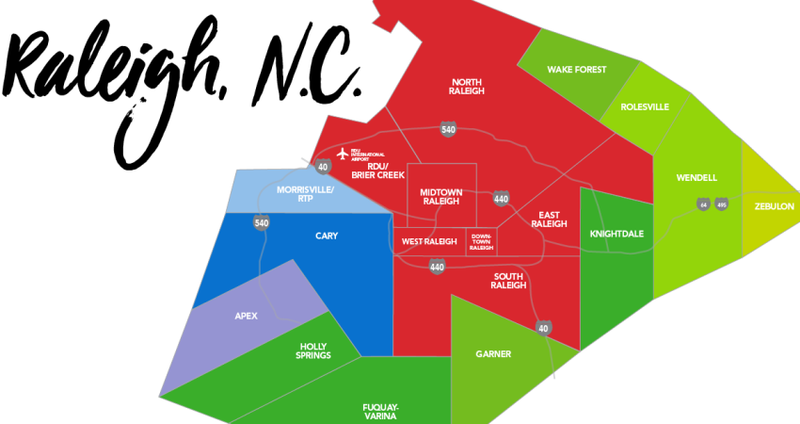 In fact, the visitRaleigh.com redesign, launched in Dec. 2017, features a graphic on the homepage which clearly illustrates the concept that "Raleigh, N.C.," is comprised of the City of Raleigh and the 11 municipalities in the county. This is a tactic in our ongoing strategy to educate and persuade the end-user (visiting customer/travel purchaser) to see, do and spend more (throughout the county) on his or her next trip. Giving out-of-town visitors (especially those arriving from long distances/by air) a persuasive, geographic education is also a tactic made prominent annually in the front matter of the Visitors Guide and on its insert map. Do you want to know how that principle translates to measurable goals? One example is search engine optimization (SEO), which (combined with usage analytics) is driving decision-making about content we’re creating to promote the county. Potential visitors, more often than not, are searching for Raleigh, N.C.
Case in point—our best performing blogs over the past year have been the monthly “Things to Do in Raleigh, N.C.,” because that’s exactly what people are looking for to get initial travel inspiration. Develop your own niche within the market. If I was in one of our municipalities whose downtown has retained its "quaint, charming, Main Street of America" qualities, in this day of Chip and Joanna Gaines, I’d be shouting about it from my shiplap-covered office... while researching and defining some of its unique selling propositions for tourists that distinguish its own unique feel from other area towns&apos;. As a matter of fact, we do. In the CVB industry, it usually ties back to customer service, dollars-and-cents or destination marketing research, as we always have to keep the business mission of increasing visitation and customer/visitor spending top of mind.